In this video blog, I will demonstrate two variations of the horse stance exercise — horse stance vertical (for beginner) and horse stance horizontal (for active level). 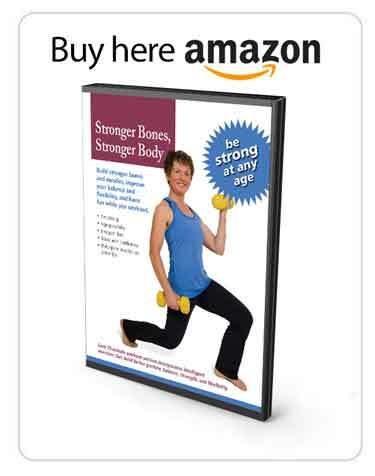 The horse stance exercise in vertical form is one of the Beginner level Strength exercises in the Exercise for Better Bones program. Start in your hands, all four position, hands and knees. Hands are placed directly under your shoulders. Your knees are directly under your hips and they’re hip width apart. Your hands are shoulder width apart. Now you want to ensure nice alignment by tucking your elbows in so that they’re facing your thighs. 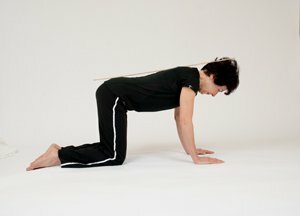 If you have a partner or a good friend, you can ask them to place the stick along your back. You can also tuck it down into your shirt or just slip it on top of your spine. You want to have a little space in the small of your back, and you want it to be in contact with your tailbone, mid-back, and the back of your hips. 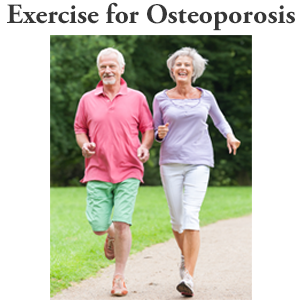 The objective of this exercise is to strengthen your spinal stabilizers. The objective is to not move your spine at all. Let’s start with a nice big tummy breath, and then slowly, gently tighten your pelvic floor, tighten your lower tummy. With everything in firm position, you want to slowly, gently transfer your weight onto the limbs that you’re not going to lift. I’m going to transfer to my left hand, both knees, and I’m going to slowly, gently lift my right hand, two, three. Breath in, and though you had a video camera just like I have on me right now, you don’t want anything moving at all, other than the arm or leg that you are going to lift. So keep everything tight, and you lift it, but nothing else should be moving, and back down. So remember to take your breath in. With the legs, legs are heavier, it’s going to be a harder motion. You start not lifting so much because you don’t have an elbow joint to lift off of, but rather sliding slightly behind you. I’m just going to re-position the stick and still take a breath. Gently tightening my pelvic floor and deep tummy muscles and I’m going to transfer my weight and start sliding just enough that I could slip a piece of paper underneath my knee and back down. With the horse stance vertical, you want sole lifting vertically, hence the name. You want to ideally go around and be able to lift each limb individually. When you get strong enough with the horse stance vertical, and although the time period, you know, you could start with one to two seconds, build up to a five and even a 10 second hold would be great. 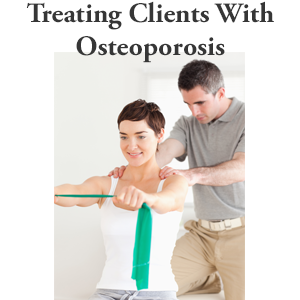 You’re working those postural muscles which are endurance muscles. You want to eventually be able to lift the opposite knee and opposite hand in a vertical position as well. So hard exercise, looks easy, but good luck with practicing it. The horse stance exercise in horizontal form is one of the Active level Strength exercises in the Exercise for Better Bones program. It targets the deep back muscles, the spine and wrists. We want to position ourselves so that we have our hands directly underneath our shoulders. Our knees, right underneath our hips with the hands shoulder-width apart, the knees hip-width apart. Once you’re comfortable in your position, elbows tucked in to face your thighs. You can place the ruler on your spine to give you the additional feedback. If you have someone in the family to do that for you, all the better. You should have a hand-width space in the small of your back. 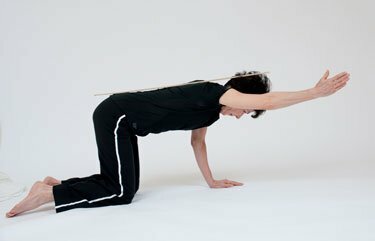 Your mid-back and the back of your head should stay in alignment with the stick the entire time. I’m feeling like I’m sliding back. So sacrum, mid-back and back of my head. With the horizontal and the active level, we’re going to be lifting the arm and leg go higher. So you’ll start with your breath in. Slowly, gently tighten your lower tummy, pelvic floor. Transfer the weight to the limbs that you’re not going to lift and raise one arm up to a horizontal level. You only want to lift as high that you can hold perfect form and back down. Breath in. Tummy gently tightens as you’re exhaling and lifting. Nothing should move other than the arm or leg that you’re lifting. You shouldn’t have any motion around the pelvis or any motion around your torso. When you have gained enough strength, you can start lifting opposite arm and opposite leg. Let’s take a look at that. No motion anywhere in the spine. I’m teaching those spinal stabilizers to do just that; stabilize your spine. With the horse stance exercise, a lot of my clients find that that continuous weight-bearing through the wrist very difficult. You could certainly use a bench for this and I’m going to demonstrate that next. Another thing you can do if you find your stick flies around too much is stick it down your shirt, and I’m going to do that next, too. Okay, so I’m going to just stick it right through. And now it’s going to give you that feedback without you worry about it sliding away. And take a breath in. Remember to transfer the weight before lifting your limb. Draw your heel away from you. And as with the wrist on hands, you can progress to doing opposite arm and opposite leg. And roll it back up. That’s it for the horse stance exercise. 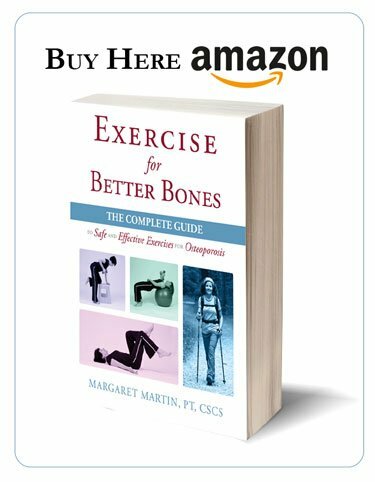 I do love all your instructions but why i never see anybody teaching how do people with osteoporosis should position themself in bed to sleep. Hi Demi, Check my blogs I have a whole series on sleeping positions.